Miami Nights 1984 is Michael Glover from Victoria, BC, Canada. His obsession with the 1980s has led to the founding of Rosso Corsa Records and a revival of synthesizer music. With Rosso Corsa he is championing many artists such as Mitch Murder, Lazerhawk, Jordan F and Lost years to make 1980s-inspired music with modern fidelity. Being among the pioneers of this revival, Mike’s first project Actrazer initially defined the Rosso Corsa sound together with output from label co-founder Lazerhawk. They coined their music Outrun, a genre of soundtrack music with epic leads and arpeggiated synths. At the same time, Kavinsky, the Outrunners and the Valerie Collective were all contributing to this new sound. 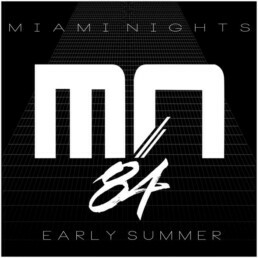 Since 2010 Michael Glover has been ecstatic about the success of his second project known as Miami Nights 1984 (MN84). Characterized by smooth synthesizers and nostalgic solos, this new sound accentuates the carefree feel of the 1980s. When asked about influences, Mike says he obviously takes from the 80s: “The music, movies, shows, cars and girls are all running through my imagination when I write a piece of music. I’m not happy with a piece of music unless I can imagine it as the soundtrack to a film or show. Ever since I was a child I enjoyed synth-based music like Tangerine Dream, Jean Michael Jarre and Ray Lynch.” His name coincides with the original run of the Miami Vice TV show on September 28, 1984. In creating his sound he uses “a variation of analogue synths and virtual instruments in Abelton Live. I’ve been using more virtual instruments for convenience and ability to leave a project without worrying about getting the same sound again.” Many of the parts are first recorded from live instrumentation and tweaked afterward in Ableton. Building on the successes of Rosso Corsa Records and an official Gotye remix, Mike released the second Miami Nights 1984 full length album Tubulence. 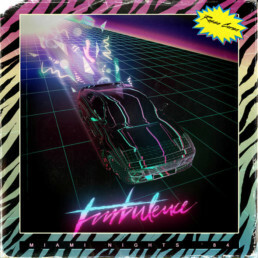 Spanning 12 tracks, Turbulence builds upon the synth-pop charms and synthesizer solos from Miami’s first album with more character: orchestra stabs, percussive rushes, slow motion bends and epic interludes distinguish the album. So does the album’s more intense moments which promote the Outrun electro sound we have championed for many years.